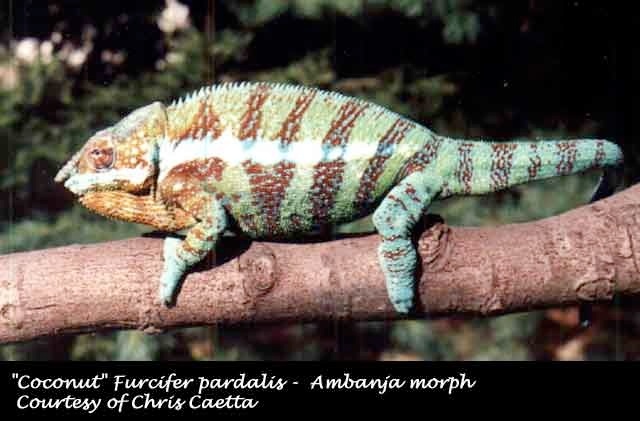 I started into Chameleons in 1990 when I bought a Senegal Chameleon from a man I'm sure was on the 10 most wanted list of smugglers. I promptly joined the CIN (Chameleon Information Network) and waited anxiously for my first issue. Upon seeing my name on the contact list I felt as if I was living in a parallel world with "The Jerk" as I jumped up and down screaming " I'm somebody now! I'm somebody now !!!!! " I then started calling everyone I could find for info and started to put the puzzle of chameleon care together. To the letter, I followed every article preaching how chameleon care must be done! I started breeding Veileds, then acquired Quads, Melleri, Deremensis and was lucky enough to get a pair of Parsonii. But that was before you needed a second mortgage to get them! I soon set my sights on becoming the largest Panther breeder in Ohio and began making several Duramesh cages. I bought the finest bloodlines I could find. When I was done, I had acquired approximately 50 adult panthers and was ready for the BIG BUCKS to roll in! $$$$$! That was 12 years ago and I'm STILL waiting. An unfortunate draw-back to living "up North" in the continental United States is 8 months of below-freezing weather which has laid many stumbling blocks upon my path. I consider myself very fortunate because I was able to maintain approximately 50 adult chameleons plus whatever young I had at the time while financially breaking even with my sky rocketing heating and lighting bills. Winter shipping problems and getting food during the depth of winter was a whole other ugly side of the story. The only thing that kept me going was the love of the game. 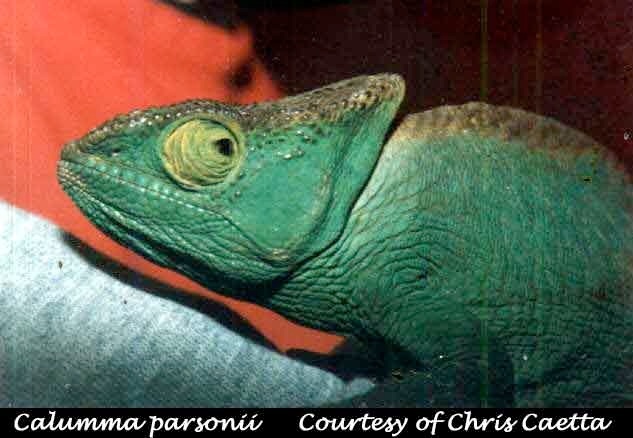 At this time, I was continuously making calls looking for other points of view on the husbandry of chameleons. I found a buried treasure right in my own back yard. Wolfgang Kruger was on my CIN contact list and lived only a few miles away. 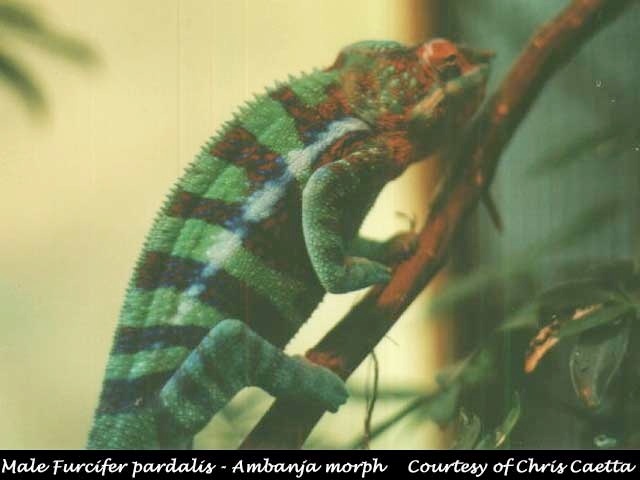 Many times over the next few months I called to chat about chameleons and discovered he had extensive experience in chameleon husbandry. I wanted to meet him and we set up a "You show me yours and I'll show you mine " sort of thing. From the deep German voice on the phone I imagined that I was about to meet Sgt. Shultz from Hogan's Heroes. I knocked on the door equipped with my 6 pack of Red Wolf beer (for a good impression ) and found myself face to face with an Ozzy Ozborne look alike! I asked if his dad was home. "I'm Wolfgang" he replied. Wolfgang was full of past chameleon experience and new ideas. The one thing we differed on in our discussions was that I was preaching what I had read and believed to be THE LAW. This law states that chameleons must be kept in screen cages. Wolfgang happened to be a glass tank man for Panthers and Veileds. 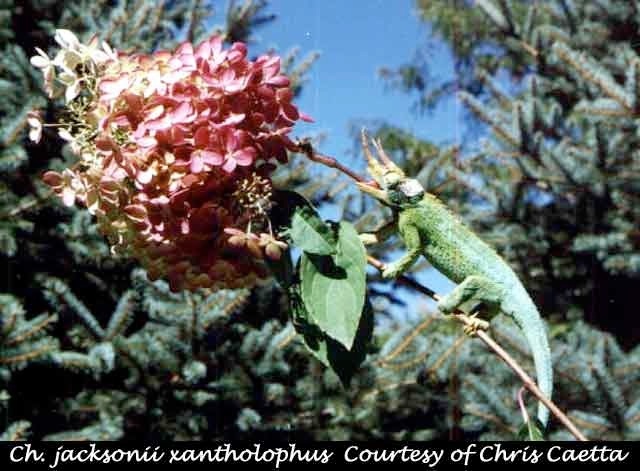 He believed that keeping chameleons "up North" requires a much different set of husbandry techniques. We are not blessed with ideal climates like our Southern Californian counterparts. Typically our summer "chameleon" weather is June through September. By December we are pretty well set for 20 to 30F (-1 to -7C) degree weather until March when we slowly warm up and start all over again. We have had to modify what was considered "Law" by so many others. 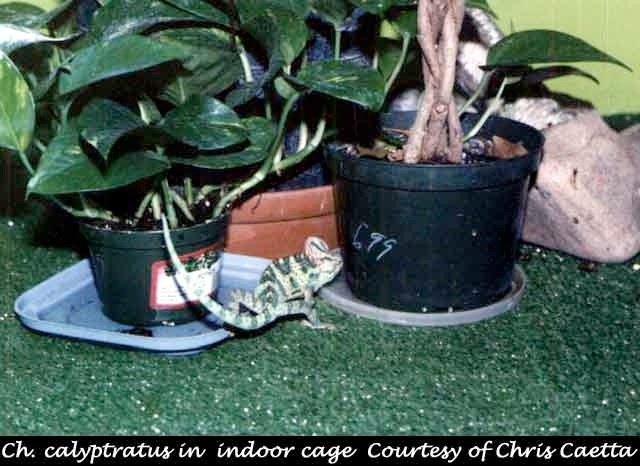 As our climate prevents keeping chameleons outside almost year round in natural sunshine and fresh air, keeping chameleons during the freezing times requires different husbandry techniques. Once a reptile is taken from ideal outside conditions and forced to be maintained indoors the rules change. 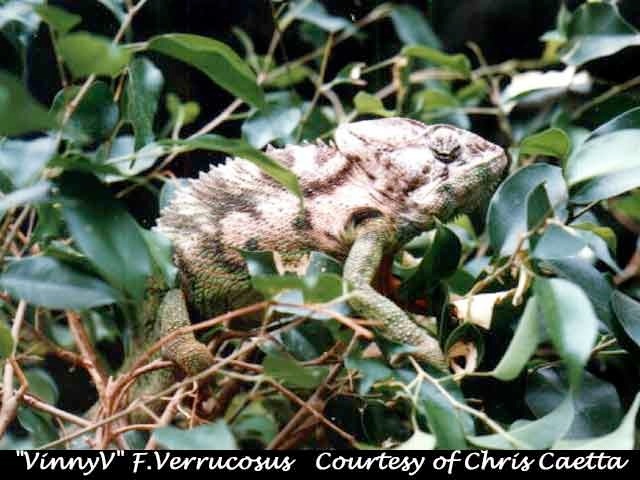 Much of the current advice offered for maintaining chameleons simply will not work in the colder climates. Keeping a chameleon outside with near perfect conditions year round in no way applies to keeping the same chameleon indoors year round. Period. We always liked the analogy that it is akin to us capturing a squirrel, keeping it outside, and claiming success! This discussion will focus on caging this time around (Maybe other "Up North" key elements may follow in the future). Utilizing screen cages for various montane species is still recommended in our climate, as the increased air flow and normal, cool room temperatures are ideal for such species. The problem arises when warm climate chameleons are maintained in rooms where the ambient temperatures are far below their ideal ranges. It is impossible to keep these species healthy in the long term by using a screen cage in a room where temperatures hover around 70F (21C) or below. A screen cage would be effective in this situation only if the chameleon room is serviced by it's own heat source. Putting a heat lamp on a screen cage will only maintain the proper basking temp, not the ambient temp required by these chameleons. The chameleon is forced to go through a major "see-saw" temperature swing when maintained in this manner. When a chameleon leaves it's basking light to an average room temp of 70F (21C) or less is very unnatural and will result is respiratory ailments. The ambient room temperatures during our 8 month "human diapause" averages 68F (20C) degrees and many herp lovers in the area have their reptile rooms in a basement. 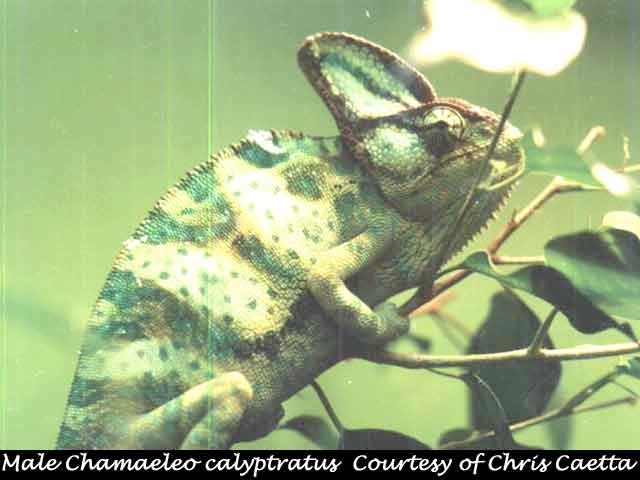 When the chameleon moves away from the basking lamp or when the lights go out at night the temperature drops quickly from the upper 80's or more than 90F degrees (27 to 35C) to 68F (20C). An enclosed cage will allow the chameleon to cool much slower and minimize the shock. 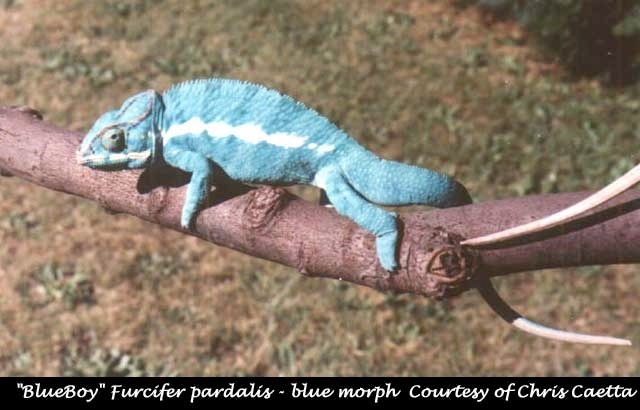 What we have used, in our very successful group of chameleon breeders here, is a European style cage design. They are typically constructed of wood and glass. I like to use pegboard backs in my cage construction, which, like screen, will allow some air exchange, but, unlike screen, will also prevent heat from escaping the enclosure. If a screen cage is used, the cage can be wrapped in the winter with cardboard to maintain ambient temps. There is much debate over using glass aquariums with chameleons. It has been very much a one-sided debate. 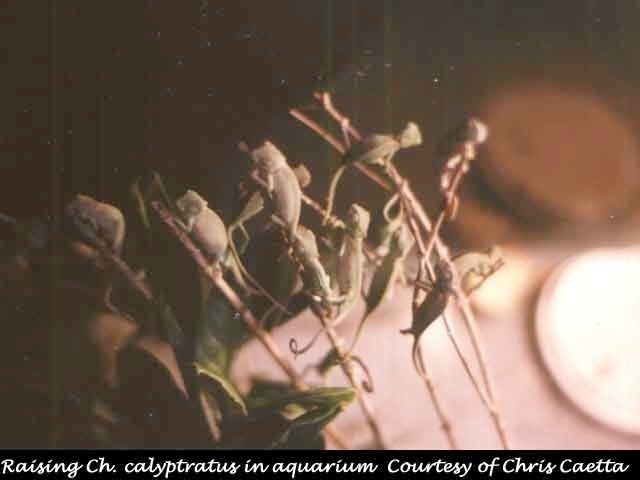 I have hatched and reared hundreds of neonate Veiled Chameleons using different lighting and supplement regimes, to adult breeding age. I have always had 100% hatch rate with my Veileds and Panthers maintained in this manner. The rest of our group has had similar results even with species that had not been hatched before. Most of these results were obtained before the reptile-specific supplements were widely available for herpers. Supplements have played an important part in our husbandry. Over the past 12 years of knowing Wolf I have watched his collection change and evolve. I can honestly say his health record is unmatched by anyone I have met to date. I know that his opinion on Upper Respiratory Infection's has held true due to the condition of his animals. Following his lead, I have also raised Veileds and Panthers in two wood and pegboard cages and have found the cages to be quite accommodating to the chameleons. I used a good quality indoor/outdoor carpet on the bottom which provided me with easy clean up with a hand vacuum. 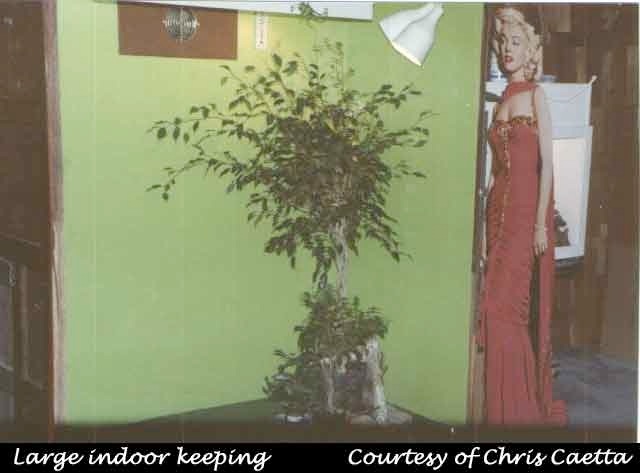 The addition of a large-leafed potted plant to the cage held the humidity well with no concerns of bacterial or fungal infections. If the peg board is on opposite sides and the top the cage is allowed to completely dry between mistings. The same principal can be used with glass tanks with screened tops. We also believe there is no basis for the theory that seeing their reflection in the glass stresses them or leads to Upper Respiratory infections.